Is Love Enough for These Two Tigers? Two Siberian Tigers on the prowl to save their species. San Francisco has a law against unleashed cats in city parks, yet it couldn't protect anyone from the first tiger mauling at a city zoo in history. Love is in the air, and not just for you ladies and gentlemen. On Tuesday, two Siberian tigers made a love connection at the Beardsley Zoo, according to the Connecticut Post. After a couple months of being neighbors, Booskin, the 6 year-old Siberian tiger and Naka, the 5 year-old tiger, finally got the chance to spend a little time getting to know each other. Like any first date, it all began with an initial friendly greeting. Not your typical handshake or hug but nonetheless a greeting that expressed interest in one another. Gregg Dancho, the Beardsley Zoo director, told the Post the tigers rubbed heads and greeted each other with some sort of snorting sound that is similar to the purr of a smaller cat. After the two lovebirds got over the butterflies and nerves that come with finally going on your first date, the two were ready to get serious. But like any typical first date someone has to play hard to get, and Booskin sure enough had to play it cool as Naka took it upon herself to do the flirting -- but her efforts fell short short when Booskin got cold feet and ran away, according to the Post. This love match is part of Beardsley Zoo's participation in the Association of Zoos and Aquariums’ Special Survival Plan, a program that began in 1981 to manage and conserve populations. Only about 300 Siberian tigers are still roaming northern Asia. As the tigers continues to loose their homes, the closer they are to becoming extinct. 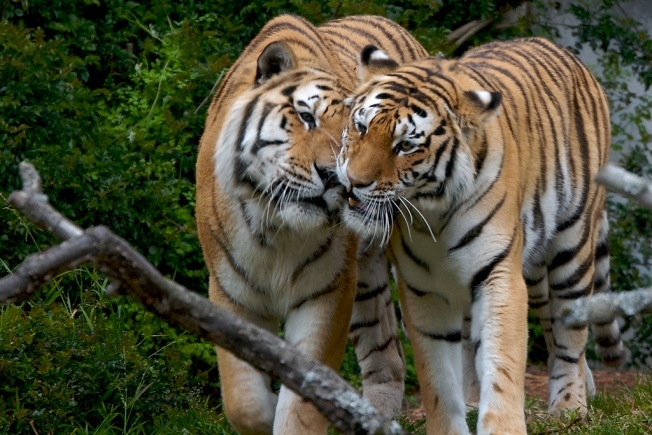 The last successful love match was six years ago when two Siberian tigers bred. Dancho explained these arranged dates are essential to helping the species survive. Talk about pressure to perform. It's snow joke: The Vancouver Winter Games are here!